Designed for a 1-5/8 x .083" wall side-bar tube. This kit allows a roll cage side-bar to swing open by using a weld clevis and weld tab on the lower end of the side bar and a weld clevis and weld eye bolt on the other. It can be installed on applications where the main hoop is behind the B-post. A tube use used to move the eye bolt and clevis to clear the door opening. Simply remove the spring-loaded pin at the top and the bar can be swung open making entry and exit easy. Kit includes all parts to complete one side bar. NHRA accepted. 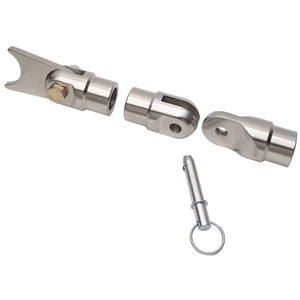 Swing-Out Clevis Set - 1-5/8" x .083"